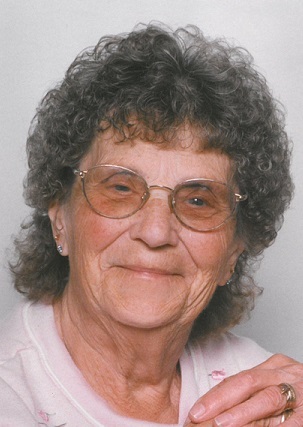 Obituary for Roberta (McFarlan) Gross | Cromes-Edwards Funeral Home & Crematory, Inc.
Cromes-Edwards Funeral Home & Crematory, Inc.
ROBERTA "BERT"GROSS, age 90 of Sidney, passed away Tuesday, March 26, 2019 at 10:33 AM at Lima Memorial Hospital. She was born on February 1, 1929 in Quincy, Ohio, the daughter of the late Robert and Grace (Thrush) McFarlan. On September 10, 1947 she married Victor "Red" Gross Jr. who preceded her in death April 25, 1984. She is survived by five children Virginia (George) Fouse of Mt. Victory, OH, Paul E. (Marty) Gross of Sidney, Pat (Jim) Zimpfer of Anna, Lynn (Doug) Frilling of Montra, and Ann (Tony) Herring of Maplewood, one brother, Robert Jr. (Dora) McFarlan of Sidney, 18 grandchildren, numerous great-grandchildren, great-great-grandchildren and nieces and nephews. She was preceded in death by son, Victor "Bud" Gross, daughter-in-law, Peggy Hammer, two sisters, Virginia and Mary Katherine McFarlan, and two grandchildren, Ben Zimpfer and Shelly Herring. Mrs. Gross was a graduate of the former Perry Township High School. She retired from Copland Corporation after 25 years of service. She was a member of Maplewood United Methodist Church. She enjoyed women's card club, playing bingo, working on puzzles, and cross-stitching. She also enjoyed traveling, and sitting around the campfire, but most of all she loved her family, who will miss her greatly. Funeral Services will be held Friday, March 29, 2019 at 10:00 AM at Cromes-Edwards Funeral Home, 302 S. Main Ave, Sidney, with Pastor Michael Mitchell officiating. Burial will follow at Shelby Memory Gardens in Sidney. The family will receive friends on Thursday from 4 to 8 PM.